Metform’s “Lock Seam” metal door roll former is understated in the market. 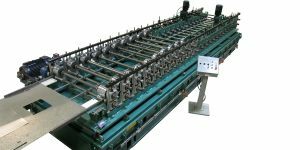 It can produce panels with notches very close to the end of the sheet with minimal distortion. This was only possible after a significant amount of roll tooling development on this product. 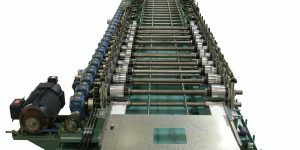 This line can run multiple material thickness of stainless steel and galvanized. It can run sheets with large window cut-outs with no tracking or distortion issues. Metform’s “Lock Seam” mill is flexible and provides quick changeover with LDT readout for accurate positioning for sheet width changes. Are you looking for flexibility, throughput, quality and better floor space utilization? Call us. Metform’s adjustable lock seam door mill allows you to run different widths and door thicknesses utilizing multiple gauge materials.